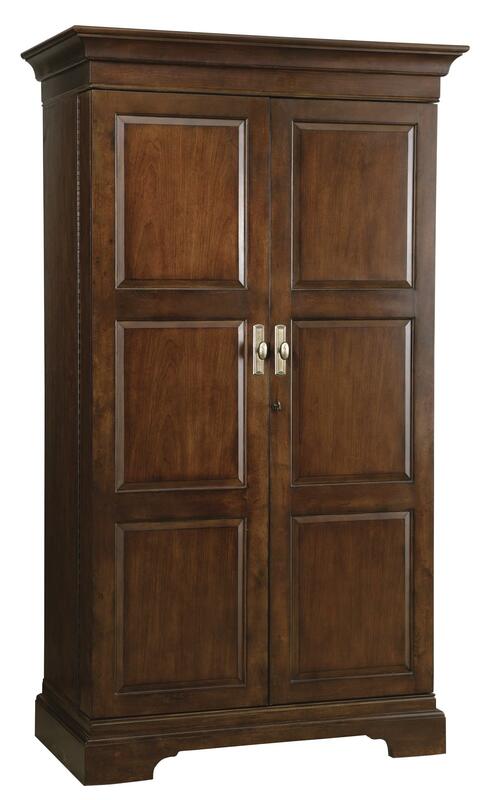 Two large doors hide a complete bar with a classy armoire facade with raised door panels and traditional moulding. Featuring a 22-bottle wine bottle rack, stemware rack, ten shelves, two drawers with lift-up shelves for extra counter space, auto-on light as the cabinet doors open, as well as a power strip to operate small appliances, this complete bar cabinet has everything you need to entertain family and friends for every occasion. The Wine & Bar Furnishings Sonoma Cabinet by Howard Miller at HomeWorld Furniture in the Hawaii, Oahu, Hilo, Kona, Maui area. Product availability may vary. Contact us for the most current availability on this product.